The first of two Members Exhibitions was opened on Saturday 28 May at Kirstenbosch Botanical Gardens, Cape Town. This exhibition runs until Monday 6 June 2011. 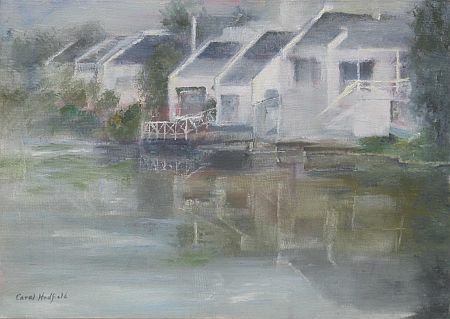 I entered one of my en plein air paintings done at a private home at Marina de Gama. The whole painting was done on site, I didn't touch it at home in case I messed it up. I hope I have conveyed the tranquility of this beautiful venue. What a place to retire to! You caught it beautifully, I used to live in Marina da Gama and knew immediately what you had painted. Stunning! Congratulations! I used to live in Muizenberg and we used to windsurf around the Marina Da Gama. Lovely rendition. Your reflections are perfect, I would like to live there. Good luck to you! Wow, I haven't blogged for so long that I thought I may have been deserted! but I haven't! Thanks Angelique, Jean, and Barbara. Lovely words of encouragement.